Tribune article on the substance of why things may be changing in Bensenville. That might explain why Mayor Soto seemed so determined to convince residents to oppose Pace's original proposal, which I previously criticized. One thing the article alludes to but doesn't discuss in depth is the plane noise making the area less desirable to residents, although that issue has been discussed at length elsewhere. It remains to be seen what the long-term effects will be. But at least the article is contrary to the conventional wisdom that Chicago condemned most of Bensenville. Also, industry doesn't mind the noise. But at least the article is contrary to the conventional wisdom that Chicago condemned most of Bensenville. That's true, so it's understandable that Bensenville would want to improve their reputation. Most of it is actually a nice town so it would be a shame to see it get to the point where no one wants to live or open a business there. Actually the statement that "Chicago condemned most of Bensenville for O'Hare expansion" is probably not too far from factual truth. When the airport was first built, Chicago took another good chunk of then-inhabited Bensenville east of York and North of Irving Park. Chicago Fire Dept had to set up a temporary engine company out there so there wouldn't be a chance of a massive fire before the buildings could be leveled. Yeah I would say almost 25-30 percent of the community was wiped out. It sure was crazy driving over there looking at condemned house after condemned house. Everything north of franklin and east of York is basically gone. Any information on the revised 319? 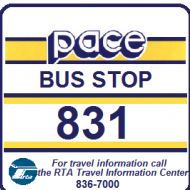 The revised 319 schedule will go into effect on December 19. Most weekday and Saturday trips will continue to operate between Grand/Nordica and Wolf/North. However, at Wolf/Grand, some weekday rush period trips will be diverted north to Franklin Street towards Bensenville. Service on Belmont and on Franklin east of Wolf Road will be discontinued. Passenger notice for the changes to 319 and some other routes. 319 new schedule. The public hearing results were no mistake, there ARE some trips from Bensenville to Wolf/North. That's nuts. Who are the riders, Wal mart customers? Lol!! I think this whole schedule is kind of screwy. They had decent ridership on belmont maybe not on the east end but from 25th west yes. Then abandon franklin east of wolf??? Some will be complaining about that. Looks to me like they are trying to kill the route. #319 kind of does poorly on grand. I can only think the crossing of two or three rr crossings was to much to bear. This might be changed back in time if #319 still exists. That's nuts. Who are the riders, Wal mart customers? Pace originally wanted to reduce Bensenville service to hourly, which they did for those coming from the east end. The new trips from Bensenville to Wolf/North allow more people to have convenient access to jobs in the Bensenville industrial area. Most riders on those trips would probably transfer to 318. I think it's a smart solution because Pace effectively stuck with its original plan to reduce service, but still met the concerns raised by Bensenville by adding trips to somewhere else that replace what was cut. There is a reason why there is not a wolf bus. I understand that was the only way to get to wal mart before but this intentionally makes a wolf rd bus. That corridor is weak and basically they are serving Bensenville metra as the factories are mostly east of wolf. I expect this to be the weakest ridership on the system. I wonder how this got suggested? Pace is not really designed for transfers if that's where they intend to get riders. It would have made better sense to send a couple #318s to bensenville. The thing that's new, and apparently explains the apparently inconsistent frequency information in the board meeting result is the Bensenville shuttle. I guess people boaridng in Bensenville better have their Ventra cards. There is a reason why there is not a wolf bus. Most riders on those trips would probably transfer to 318. I finally got a grasp on what this was about. The shuttle goes to Wolf/North, not Wolf/Grand, although the timed connection with 319 appears to be at Wolf/Grand. The shuttle also doesn't appear to be interlined with 319 at Wolf/North.Doesn't look like it is interlined with 318, either, but is harder to tell. I don't think a timed connection is intended. Westbound buses get to Wolf/Grand at exactly the same time. Eastbound buses from Bensenville miss the Grand Ave bus by 6 minutes. Are there any changes for the summer pick? Starting this weekend (June 11, 12), there will be changes to weekday service on Route 308 (service will run later), weekday and Saturday service on the 322 (trips will continue to run later, and Saturday service during daytime hours will be more frequent - every 20 minutes instead of every 30 minutes). Route 313 will be permanently rerouted so that it will now operate on 25th Avenue instead of Broadway/19th Avenue between Lake Street and St. Charles Road. One trip on the 309 that currently ends at Wolf/North will be extended to Elmhurst Metra station. Finally, Route 392 will be extended to the Cicero Avenue Green Line station and will have the route name changed. The biggest improvement is the 313 reroute which should improve on time performance by eliminating conflict with UP freight and Metra trains. I was wondering the rationale, since it would miss downtown Melrose Park, if there still is such a thing. The 303 still runs through "downtown Melrose Park" but I wonder if it also make sense to put this route back on 25th Ave between North Ave and Madison. At least on Madison there are 2 other routes that could compensate for delays on the 303. This route crosses tracks in Melrose Park and Franklin Park. The 332 now operates south of Irving Park n Manheim to Seymour and wes on Seymour between Manheim and Irving Park,giving workers in that area better access to the Blue Line.